December | 2015 | Chubby For Life? This has been a terrible year for cycling and a good and bad year for me. My brother seems to have been cured of cancer (we will know for sure next month when he has a PET scan). He has a car and a new life. My daughter has moved a thousand miles from us and leaves a surprisingly large hole in our world. Skype is nice but hardly a substitute. My weight is up but that is temporary. I have plans. I’m going to get on the bike every opportunity that I can. This will be a year of hours in the saddle. The plan is to improve this blog by taking more pictures and telling more stories. I’m going to add Veloviewer to my rides to give a better description. For example here is a ride that I did this year when I rode to Chatham. As I approach sixty (nine months away) I long to see old friends. People I know have scattered to the four corners of the world. I think it’s time for some trips. Plus I’ve never been to Las Vegas and it is time. I have many years left, it’s just that they are finite. I want to use them to their fullest. 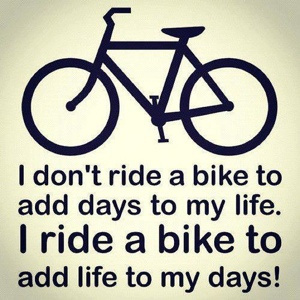 Cycling is a big part of my future. Come with me and explore the small towns of Ohio and possibly the world. This has been a horrible year for cycling. That said my brother is cured of cancer and has a chance of staying that way. The doctors say if he avoids drinking and smoking he was around around a 25% chance of cancer returning. The bad news is that if it returns he probably won’t be able to beat it again. It’s up to him now. The New Year is approaching and I have a lot of plans. I will be riding every chance that I get. I want to explore and see everything. I was looking at my Canon T3i yesterday and I realized how few pictures I took. I took a large number with my iPhone but there was a time when I considered myself a serious photographer. The best picture I took this year was when I was in Boulder, Colorado and took this at The Garden of the Gods. Since I’ve retired my life has been expanding exponentially. Being raised by an agoraphobic I’ve never traveled. Since this is a cycling blog I don’t want to talk too much about my other pursuits, chess, guitar, genealogy, banjo and poker. I’ve been walking every day and riding the trainer every night. Instead of concrete goals this new year I want to get on the bike as much as possible and visit as many little towns as possible. I’ll be sixty in August and I’d like to be as fit as possible. I will be rejoining the Silver Wheels Bicycle Club and starting with the Lake Erie Wheelers. Between the two I will have plenty of rides. Plus I will be meeting like-minded people. If you’ve been looking at this blog every once in a while and were disappointed, forgive me. It will get a lot better. I plan to attack the road this year. Saw this video of a cyclist ignore a train crossing gate that was down and runs into a bullet train that is going ninety miles an hour. According to the site he was knocked unconscious but was otherwise ok. Ouch. Once my brother had healed sufficiently he needed to get a drivers license. He hasn’t driven in twenty years and no license for twenty-five. It was time. I needed to get him up to speed so I had him get behind the wheel of my Ford Ranger Pick-Up. After he adjusted the seat, mirrors and wheel he started pumping the gas pedal. I asked what he was doing. He said he was sending gas to the carburetor. I explained that all cars now use fuel injection and that pumping the pedal would do nothing. He’s been away from the world so long I call him Rip Van Stupid. He drove too close, too fast, too few turn signals and too fast around corners. I tried to channel my 37 years of UPS experience into him. I gave him a crash course in driving. He had no idea you used a turn signal at stop signs. Minutes in the car with him were like hours. Hours of frustration and fear. Finally the time came and he drove to Parma for the test. I had to yell to stop twice as he rushed up behind someone as we prepared to stop. We found the BMV and he parked so badly that the lady came out and asked us to move. It was a bad sign. Finally someone came out and took him for his test. He was allowed to miss 25 points and still pass. I watched him take the maneuverability test and cringed as he hit the cones, twice. Each hit of the cone took off ten points. It looked grim. I closed my eyes and tried to think good thoughts. It wasn’t easy. Time passed slowly and he came in with a smile. He passed. I have to assume he got a pity pass. That is the only explanation. Wow. Once he gets a car I will be free. He can go to his appointments and even look for a job. I will leave this circle of Hell. As I’ve been writing, I’ve been helping my brother deal with his cancer. Couple weeks back he needed to have surgery on his neck to remove the remaining lumps and lymph nodes. Many appointments were made and plans designed. We went into Cleveland numerous times for testing and meetings. We were told all of the risks. There are important nerves that run down the neck and severing them could affect swallowing, talking, etc. As my brother doesn’t drive I spent many hours each day. Drive the fifteen miles to his house, wait for him to get ready (he was never ready to go) drive to Cleveland (25 miles or more), sit in a waiting room, drink bad coff ee, see a doctor, wait while testing, drink more coffee, more testing, forget where the car was in the parking garage, find it, head home and do all of the errands he needs. Most days were most of the day. Finally the day of the surgery came and we got there bright and early. We were there by nine, meaning I left my house at seven, and he was back in pre-op by ten. I went out and had a bagel and studied some chess. Around eleven I was allowed back to see him. He looked pretty good. It’s amazing how much weight he has lost. He was upbeat and they sent me back to the chessboard. Seidman Cancer Center is a great place. They give you a pager like they have in restaurants. I was able to take my set to the cafeteria and study. Every two hours they update. While studying a young doctor challenged me to a game of speed chess, easiest five dollars I’ve ever made. He was in surgery for nearly seven hours. Then I had to wait for him to get out of recovery. He was out of it when I saw him and you could tell it was major surgery. I left at 9:30pm exhausted from doing almost nothing. He stayed in the hospital for three days and he is doing well. The surgeon was able to avoid the nerves and the only side effect is he can’t feel his ear. The week after was follow-ups after follow-up. Soon I will be free.